Flanged Type Helical Gear Motor Relying on the technical expertise and outstanding experience of our team, we have been successful in carving a niche for ourselves as a prominent manufacturer and supplier of Flanged Type Helical Gear Motor. Owing to their attributes such as smooth performance, sturdy construction and easy installation, these helical gear motors are high in demand. 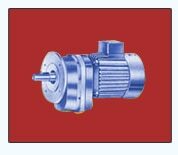 Our manufactured range of Flanged Type Helical Gear Motor is widely used in agriculture and automotive industries. These also used in agitators and stirrers.